Jan. 22-27, 2019 is National Drug & Alcohol Facts Week®. Help #ShatterTheMyths about drugs and alcohol. RT NIDAnews: Thank you to everyone who participated in this year’s #NDAFW. The week-long observance was a great success and we look forward to having you join again next year. If you haven't heard about @PeerHealthExch, they're an amazing org! So pleased they're hosting a #twitterchat with me and @DanceSafe for #NDAFW. #NDAFW Share the facts about Marijuana and teens. Supporting the thousands of schools and organizations ready to kick off #NDAFW. Lucky to be on the @TODAYplaza with @DylanDreyerNBC telling me it’s below zero temps! Ready for #NDAFW? Learn more about the warning signs that may indicate a student is impacted by opioids, alcohol and/or other substance abuse – and the strategies to support them. #NDAFW 2019 is January 22–27, 2019. Go to https://teens.drugabuse.gov/national-drug-alcohol-facts-week to see who is hosting an event. January 22 - 27 is #NDAFW. Get the facts! #NDAFW is coming! Learn all you can, be ready for the #ShatterTheMyths quiz! National Drug and Alcohol Facts Week® (NDAFW) is coming January 22-27, 2019. NDAFW is a national health observance linking teens to science-based facts to SHATTER THE MYTHS® about drugs! Help educate your community about the dangers of #RxAbuse by getting involved with @NIDAnews' #NDAFW, which is January 22-27, 2019. You could post flyers in your #pharmacy or organize a 5k run. Find more ideas here. Educators, if you might want to get involved with National Drug & Alcohol Facts Week #NDAFW 2019, here's one source of ideas for planning! 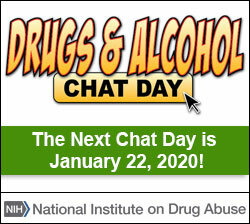 #SaveTheDate: Registration is now open for the 12th annual National Drugs & Alcohol Chat Day. High school students who register will have the ability to chat live with addiction and mental health experts. A9. #NDAFW I haven't had the opportunity to do an online event yet, but I would definitely use streaming to do it.